CHILDREN OF NOTHING, THIS IS OUR SONG! Cancer Bats are already looking to a big new year with the announcement of early 2019 gigs. See them explode on stage at Wedgewood Room in Portsmouth, The Sugarmill at Stoke, Manchester Rebellion in January. Plus, Nottingham’s Rescue Rooms, Epic Studios at Norwich, Cambridge Junction and 100 Club in London during February. Excitement is already high and still rising as is the demand, so make sure you do not hang about and book your tickets for Cancer Bats before they are all snatched up. Fortunately, placing your order with Gigantic is made easy as your purchase can be made 24/7 at home or on the go using your smartphone, tablet or computer. 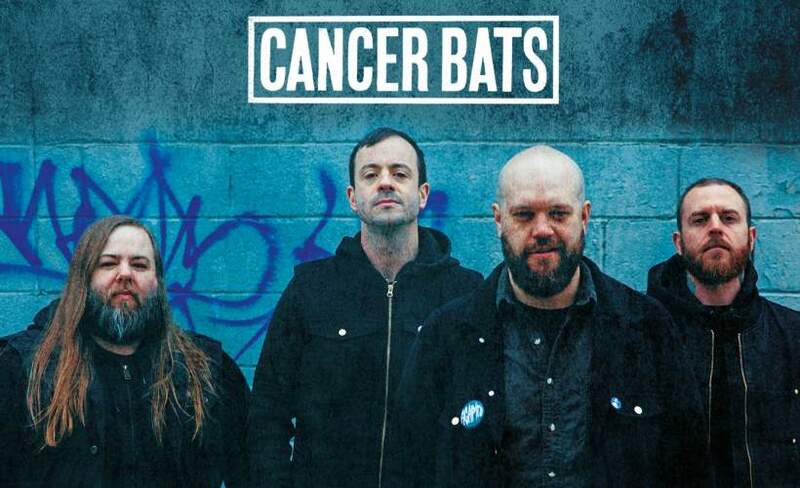 Proving that loud, gritty, and ranting punk rock is still alive and thrashing in Canada, Toronto's Cancer Bats were founded in the spring of 2004 by singer Liam Cormier and guitarist Scott Middleton. Cormier and Middleton had worked together before in a metal band called At the Mercy of Inspiration and were looking to launch a new project that would take their music in a harder but more elemental direction. Teaming with bassist Andrew McCracken and drummer Joel Bath, they formed Cancer Bats and recorded a four-song demo that they sold at shows in early 2005. After a few months, the group became disenchanted with drummer Bath, and Mike Peters shortly took over as the group's beat-keeper. The hard-partying band released its first full-length album, Birthing the Giant, in the fall of 2006. It was released in Canada by Distort Entertainment, in the United States by Abacus Records, and in the U.K. by Hassle Record. The band kept up its relentless touring pace after the album hit stores, and played a major American tour opening for Billy Talent. In 2007, McCracken amicably parted ways with Cancer Bats to devote more time to his design business, and Jason Bailey, a veteran of the bands Shattered Realm and Figure Four, signed on as their new bass player. In 2008 the band released its second album, Hail Destroyer. After spending a couple of years touring the metal festival circuit, Cancer Bats released Bears, Mayors, Scraps & Bones in 2010. Amid plenty of work and development for their own compositions, the band explored a collective love of metal gods Black Sabbath with the low-key inception of Bat Sabbath, an alter ego band whose sole purpose was to dutifully cover Sabbath songs. This classic metal influence was heavy on their 2012 album Dead Set on Living, particularly in Cormier's increasingly improving vocals. Fifth album Searching for Zero was made during a time of great turmoil for the band, with exhausting amounts of touring and multiple deaths of people close to the band. This agonizing time was reflected in the dark and unrelenting tone of the album. Live music has never been more popular and with only limited supplies of Cancer Bats concert tickets being made available by the promoters, you will have to book early before they all go. With a massive selection of the very best gig tickets which only gets larger everyday plus an award-winning customer services team on hand to help with your selection, Gigantic is always the best place to come whenever you are booking for your big night out.